Downtime eliminated, all process data available to clients at all times and central diagnostics for all components in two plants on two continents guarantee proactive maintenance and optimize performance. National Oilwell Varco is an example of how an industrial network leverages digitalization and reaps benefits. 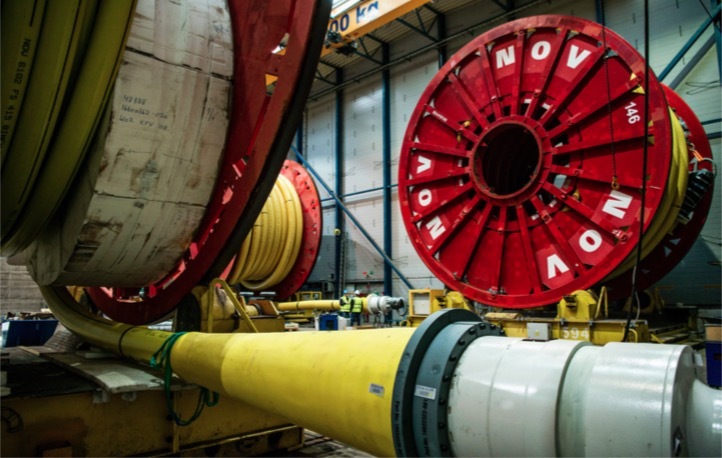 GIGANTIC FLEXIBLE PIPES for the oil and gas industry are made to live up to even rougher conditions, as they are primarily used for transporting oil and gas from the sea bed to offshore platforms or oil tankers. Some pipes are as long as 12-14 kilometers, and they are stored and transported around the plant on huge reels. The pipes consist of many layers, and different buildings accommodate parts of the manufacturing process. However, to monitor the production and ensure that all equipment is operating correctly, you can sit in the cozy office atmosphere of automation engineer Klaus Jørgensen. Or in fact, you can sit anywhere in the world, because soon every single component in the plant will be connected to one of the most modern industrial infrastructures ever constructed. Even more impressive, National Oilwell Varco has designed a sister plant in Brazil that uses the exact same components - monitored and operated to a large extent from their Danish plant. The first steps towards creating this infrastructure were taken in 2012 when National Oilwell Varco bought the NKT Flexibles Company, and started to decouple the office and industrial production infrastructures. This makes good sense - and has since become an industry demand - in a plant that runs 24/7 and where and scheduled production downtimes are extremely costly. "The inner liner of the pipes consists of an extruded polymer layer, and no matter how long the pipe, this has to be done in one continuous operation. Stopping, even for a millisecond, will lead to a hole in the plastic, and the result is that we have to scrape it all off and start the process over again," said Finn Meldgaard, Senior Business Analyst. With the new infrastructure and the corresponding upgrade of equipment, unplanned downtimes have been eliminated. "Today, the only incidents causing unscheduled stops are if our local power utility experiences a problem. All downtimes due to electronic issues have been eliminated," Meldgaard said. Some pipes are as long as 12-14 kilometers, and they are stored and transported around the plant on huge reels. A network that operates absolutely perfectly under these rugged industrial conditions cannot deploy standard switches and routers. Since Siemens′ Simatic S5 was already being used as the core of the automation equipment at that time, National Oilwell Varco turned to Siemens for a complete solution that included an upgrade to Simatic S7. "Siemens was the right partner as they could provide us with the right technology in the form of Pro net and the required ruggedized components designed for these conditions, and because we need standard components all the way down to the process layer of the single machine. We operate 24/7 and we cannot just shut down production because we need to replace a switch. This high performance is complemented by a 10-year delivery guarantee on industrial products, which is important to us," said Johnny Jepsen, a senior business analyst and close colleague of Meldgaard. Using standard components is so important that National Oilwell Varco produced a white list of components and devices that are allowed. This has several benefits that go beyond the ease of replacing equipment fast. 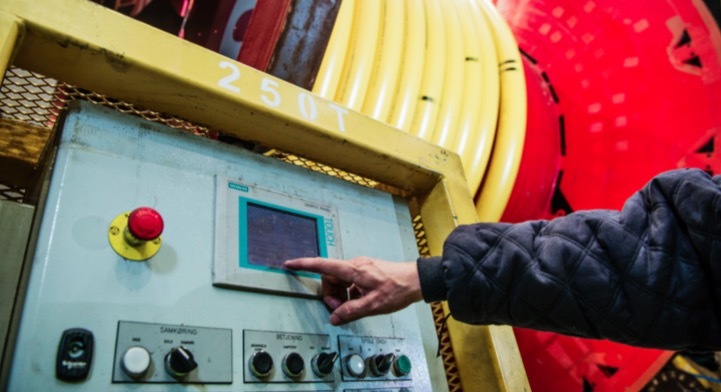 Standardization is the basis for digitalization, and it is the digitalization that makes it manageable for National Oilwell Varco to adjust the production equipment to address each customized pipe. Visiting the building that accommodates the machine that adds the carcass layer to the flexible pipes clearly demonstrates just how well the equipment operates. The machine has a diameter of approximately two meters and rotates at one revolution per second. On the wall there is a wireless access point and attached to the rotation device are two golf-ball-like antennas that are located opposite to one another. If the signal is lost for 32 milliseconds, the machine makes an immediate emergency stop. The possibility of even having emergency stops in a wireless network is one of the advantages of industrial wireless LAN provided by Siemens. Even during the emergency stops, this IWLAN system still allows data to be captured and managed. Safety is key when delivering any equipment to the oil industry, and should a breach on one of the pipes ever occur, the human and environmental damages could be devastating. To prevent this from ever happening, even the smallest step in the production process is closely monitored and documented. "All pipes are custom-made to address the temperature, salt content, structure of the waves, the sourness of the transported media and the particular installation location. They are designed in close collaboration with the client, and during production we measure everything. We take eight measurements every second and document for instance the thickness of the plastic and the quality of the weld points. This amounts to a lot of data. If you were to print it, you would need five to ten large cardboard boxes to store it," explained Meldgaard. Today, customers can choose to either receive the documentation in print or digitally because all this data is now transported through the new industrial network and collected centrally in a data center. Jepsen explains that one week of testing produces 11 terabytes of data! The test equipment is stored in two containers that can be moved around the harbor. Here, the wireless network proves its worth again, as the containers can be placed anywhere - and more importantly - controlled from a distance. "Together with the customer, we monitor and control the test via industrial WLAN. This means that no one ever has to be in or near the test containers while we subject the pipes to pressure. As a consequence, nobody gets injured in the unlikely event that anything goes wrong," explained Meldgaard. To cover the whole area with industrial WLAN requires controller-based access points as they not only have to tolerate rough weather, but they also need to function perfectly despite any interference from docking ships and other mobile equipment. "We cover the whole area, and the network is designed to transport this large amount of data, which is not possible with standard office IT equipment. Siemens has the components to handle this and are used to transmitting data at speeds where milliseconds count, which is another reason why we chose to work with them," stated Jepsen. Back in the office of Klaus Jørgensen, a monitor on the wall shows all components connected to the industrial network down to every single node. Except for a few yellow nodes, most of them are green. Had one of them been red, then immediate attention would have required. The system is monitored using the Siemens network management software, Sinema Server, which makes maintenance effective and easy to handle. However, a lot of detailed network planning and attention to detail was involved in achieving this level. "Our largest machine alone has 220 IP addresses and one of the smaller ones has 86. We had the opportunity of re-planning and organizing the complete infrastructure, and as part of the business case, we planned our network structure ten years ahead. Providing and securing data is such a vital part of the future of our company that we immediately got the necessary support and funding from our management," explained Jepsen. And everything looks organized and well planned, too. The cabinets are extremely tidy and have plenty of room for adding devices, and all cables are color-coded according to their function. "We reduce downtime and can plan maintenance proactively. If a device turns yellow, we get a graphic overview of what other devices will be affected if we take it down for maintenance, and with the white list, we know exactly what component must be used if a part needs to be replaced. The real-time diagnostics with detailed information, the graphic overview and the cable color coding mean that no matter who′s on duty, they are able to handle urgent situations, and there is no trial and error situation where someone accidently pulls the wrong cable," said Jørgensen. The Sinema Server network management software is also accessible on handheld devices, and can be set up to alert the appropriate personnel as needed. Jepsen and Meldgaard both get a text message if a component does not respond for more than 60 seconds. "We can respond very fast - and we can fix things fast. The system is so detailed that if a cable is broken, we know exactly where and what impact it will have. Or if a drive that runs a motor in a caterpillar is out of order, we don′t have to search the whole caterpillar to find the fault. We know exactly which drive it is," Jepsen said. From his office, Klaus Jørgensen can not only monitor the plant in Kalundborg, Denmark, but also the sister plant in Brazil, where National Oilwell Varco recently constructed an entire plant to produce pipes for an order from one of the world′s largest oil companies. Since the plant in Brazil is brand new, it is designed for a leaner process regarding how the buildings containing the different process machinery are located, but the network structure and the components are exactly the same as in the Danish plant. Once again, standardization proved to be the right approach to making a fully digitalized plant. "We simply used the white list and used standard components across the board, which also minimizes the number of spare parts we need to keep in stock. It is very effective and means that we can monitor and manage 80 to 90 percent of the plant from here," said Meldgaard. Data is also captured in the Brazilian plant. This data is used for customer documentation and also to optimize plant performance. "Especially since the plant in Brazil is equipped with all new machines and components, we have an excellent opportunity to compare performance and analyze whether we can replace parts or change settings to optimize performance on the Danish plant," said Meldgaard. "We also use this data to monitor and manage energy in accordance with ISO 50001 - otherwise we would have to capture this data manually," added Jepsen. This totally integrated automation configuration across two continents does not jeopardize data security in any way. It is designed as a shell within a shell, and getting to the industrial network requires finding a way through multiple layers of security. Even if the machines were to be disconnected from the network, both plants would still be fully operational. "If everything goes wrong, we can store data on the local SCADA system. Part of the business case is that all machines can run for seven days with no connection to the overall network," Jepsen said. A situation such as this is hard to even imagine. The design of the infrastructure and the hardware and software developed solely for industrial purposes seem to be a perfect match for a company where huge and complicated heavy industrial products produced 24/7 must meet documentation standards otherwise only found in medical, aerospace and food industries. Olmo Castaneira Rios, Process Automation, Siemens.